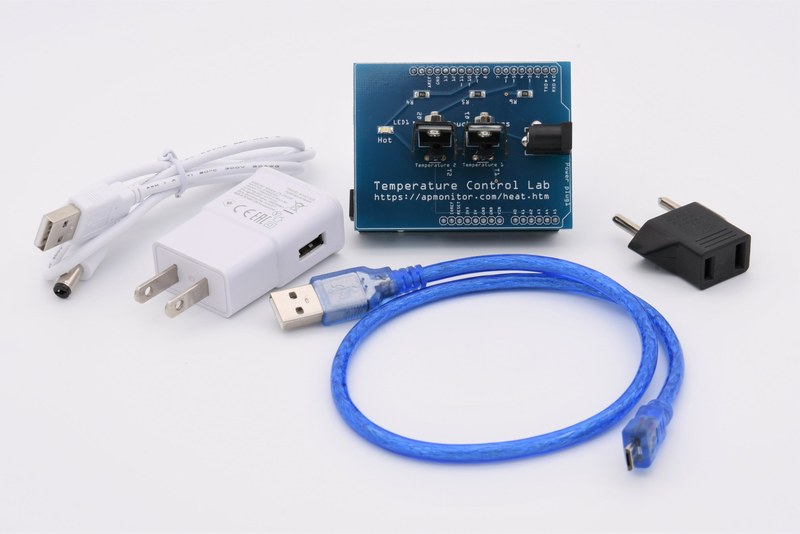 The temperature control lab is an application of feedback control with an Arduino, an LED, two heaters, and two temperature sensors. The heater power output is adjusted to maintain a desired temperature setpoint. Thermal energy from the heater is transferred by conduction, convection, and radiation to the temperature sensor. Heat is also transferred away from the device to the surroundings. This lab is a resource for model identification and controller development. It is a pocket-sized lab with software in Python, MATLAB, and Simulink for the purpose of reinforcing control theory for students. The TCLab kit is available for purchase on Amazon, through PayPal/Credit Card, or by bulk order (10+) form. Steps 1-3 with the single heater should be completed with this lab. The dual heater models and advanced control modules are included as additional but optional information. A report is due at the end of the project that details the modeling, parameter estimation, and control performance. Each student should complete the project and report individually. SimTune from APCO, Inc. provides a convenient interface to the TCLab that does not require programming in MATLAB or Python. It is a full-featured software package to implement modeling and PID tuning principles. The SimTune software has a library of simulated process scenarios for modeling and PID controller tuning. The software includes common forms learned in this course as well as common industrial forms such as Honeywell Equations (A, B, C Equations), Allen Bradley (Dependent and Independent Equations), and Control Microsystems (ScadaPack). The licensed software is freely available for those who are registered for the course, thanks to a donation by APCO, Inc. The temperature control lab is also used for Advanced Estimation and Control in the Dynamic Optimization Course. The difference between the PID lab and the advanced control methods is that the model is directly used to control the process versus only for tuning correlations. This approach is called Model Predictive Control (MPC) because the simulated system is driven to a desired set point with the use of an optimizer. Also, instead of estimating the model once from step tests, Moving Horizon Estimation (MHE) updates the model with every new measurement. The updated model is transferred to MPC for improved performance through adaptive control.